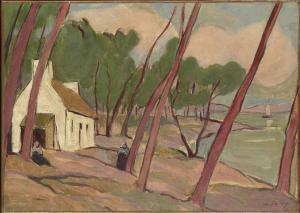 Find artworks, auction results, sale prices and pictures of Pierre De Belay at auctions worldwide. 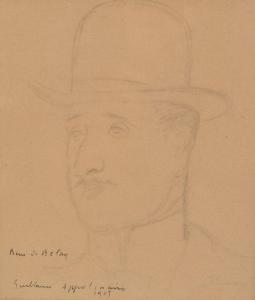 DE BELAY, Pierre, (French, 1890-1947): Portrait of Guillaume Appolinaire, 1905, Pencil Drawing, sight size 8.5'' x 7.5'', signed and titled lower left dated 1905, framed, 16.5'' x 13.75''. de Belay lived in Montparnasse in Paris, during the ''wild age'' and it was a source of inspiration. 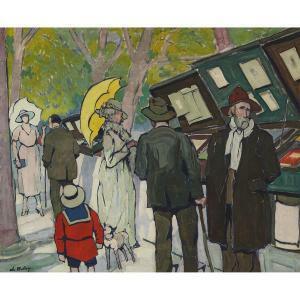 He had great success at the Gulot Gallery doing a private exhibition of Parisian life; his reputation was established as a result and he had a successful artistic career. This lot is sold subject to confirmation of authenticity due to a logistical issue. Le titre exacte est: Marins. Retour de pêche. 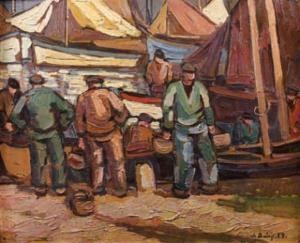 The exact title is: Fishermen. Back from fishing. Un certificat d'authenticité de Monsieur Roland Souef sera remis àl'acquéreur. This lot will be sold with a certificat issued by Mr. RolandSouef. 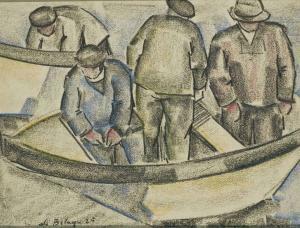 'THE FISHERMEN'; SIGNED AND DATED LOWER LEFT; WAX CRAYON ANDPENCIL ON PAPER. Un certificat de Monsieur Roland Souef sera remis àl'acquéreur.